FLVS Full Time is all about structured flexibility. 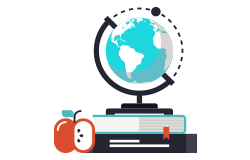 As a fully accredited online public school for Kindergarten-12th grade, FLVS Full Time offers comprehensive, full-time, tuition-free learning for all Florida students. Students follow a fixed, 180-day school year schedule from August to June. In addition, students who meet district graduation requirements are able to receive a Florida diploma from FLVS Full Time. Our students take a standard public school course load of six courses per semester and participate in state testing (including EOCs and FSAs). Courses are available 24/7 online, so students can study any time and any place. Our certified teachers provide one-on-one attention and are available online, by phone, email, or text. Students connect with peers through online clubs and in-person activities. Enrollment typically opens in the spring for the upcoming school year and as needed in the fall for spring semester.